Communicating project information is often difficult, whether it involves getting status information from your team, or communicating project status to executives. Learn when and how to communicate and report project information. Otherwise effective collaboration suffers and the success of your project might be at risk. List your stakeholders Before a project begins, find out who your stakeholders are. One sure way to stall a project is to forget a critical stakeholder who has go/no go impact on your project. Get a communication plan going early Design communication strategies and processes into your project before the project begins. Even better, have communication processes appear as a task on the first lines of your project so that this critical part of collaboration becomes everyone’s commitment. Communicate often Collecting task status information once a week is about right to head off problems before they escalate. If you communicate more often than that, team members might stop sending updates because of the extra time in preparing them. Search for problems If everything seems to be going well because you haven’t heard anything negative, you’re probably headed toward trouble. Even the best run projects have problems. Your job is to go find them before they grow into bigger problems. Use appropriate technology Understand your team member and stakeholders’ communication needs. For example, team members reporting on task status might want to use email or Project Online, whereas an executive might prefer a well-presented chart or PivotTable. Here is a list of programs you can use to help in communication. Have built-in presentation tools for all level of stakeholders. Has easily understood timeline and team planner views. Exports data to Excel and Visio for communication of complex data. Your company might not use Project. The projects your company works on might be too small to take advantage of powerful scheduling software. Best for advanced communication and reporting project information across an organization. Can compare the status of multiple projects or for a portfolio of projects. Smaller companies might need the help of consultants to install and use Project Online. Project can export data to Excel for advanced analysis, such as ANOVA and earned value analysis. Ideal for early planning of projects or for high-level deliverables that can later be added to Project. Excel lacks automated scheduling features for more complex projects. Ideal during the initiation phase when you need to share planning documents like budgets and deliverables. Not ideal for visual presentations for executive stakeholders. Use Excel, Visio, PowerPoint, or Project’s own report functionality instead. Offers syncing features without Project Server. A change in one task list will be reflected in the other. Expensive to deploy throughout company. If you don’t have the company resources to install SharePoint, you can use Office 365 with SharePoint online. Ideal for impactful presentations to executive stakeholders. Analysts and engineers might want more detailed charts for complex budget analysis. Ideal during the initial phases of a project where you need to communicate business and manufacturing processes with flow charts or other diagrams. Might present too much information for an executive audience. Use Project’s own reporting features instead. Ideal for teams in different locations. You can share project information with instant messaging, voice, video, or during online meetings. May require an IT department to deploy. If your team is using Project Online, download task status updates from the server before you communicate with your team about project’s progress. There are simple ways to track progress, and there are more complex ways. Find the way that works best for your project and your team. Capturing earned value information is a more advanced, but very powerful, step toward discovering the good and bad of project’s performance. The high-level facts you acquire from this is what your stakeholders want to see. With Project, you can create and customize striking graphical reports of whatever project data you want, without using any other software. As you work on the project, the reports change to reflect the latest information — no manual updates required! Team members can view the schedule and update their work in SharePoint, and you’ll see the changes in Project. And vice-versa. 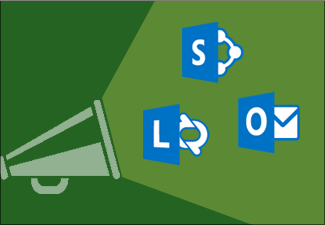 Communicate project information using Office 365. As long as you’re working on a PC with an Internet connection, you can work on your documents using full versions of Word, Excel, PowerPoint, or OneNote—on demand, anywhere. When you make changes to tasks, publish those changes to Project Online so that everyone has the right information to continue their work. If people can’t come to a meeting, use Teams to share project information. Share PowerPoint slides, Excel sheets, or a OneNote notebook to share project plans. People can participate in online meetings in their office, at home, or by using their mobile device.